When Jim Campbell and I presented Mallard at the WritersUA conference last week, we wanted to show off how easily you could drop a page into a directory and have it picked up by the dynamic linking system. 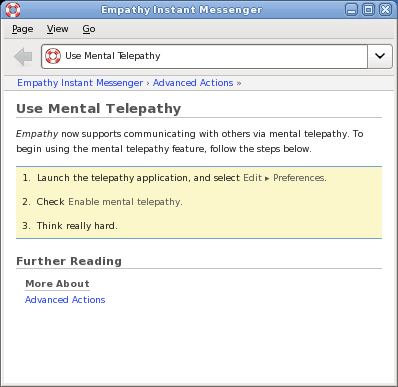 So Jim created a help page for the (sadly fictitious) “Mental Telepathy” plugin for Empathy. We could just drag it into a folder and restart Yelp, and people would ooh and aah. I hope to see this feature ready by 3.0. Is it compatible with the Force Trainer from thinkgeek? Is Mental Telepathy going to be released with GNOME 3.0 ? Stupid GNOME devs! Now you want to remove the messaging feature and want me to think! Urgh, what’s next removing the Interface tab in Appearance capplet? OHWAIT. Great stuff Shaun, you should have included an image there though, or a funny video, don’t know. You can exploit the joke for demoing more cool stuff of mallard and yelp I think. I see a bug in that documentation. I’ll have to submit a bug report.